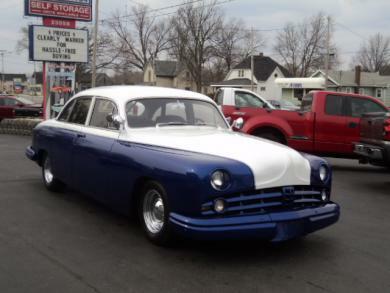 This is a Custom 1949 Lincoln Sport 4 dr. sedan with suicide rear doors. Has the moon wheels and good tires. The car is equipped with 12 volt system and not the 6 volt that came with it. It is equipped with power steering and power brakes and they work very good. The interior is custom and has a working power driver's seat. This car is equipped with air conditioning and tilt wheel that is telescopic. The car has a finished trunk. The transmission shifts fine and smooth. The car has front power windows with the two rear windows in place. It starts excellently and the battery is good. All lights are in good working condition. This car could be driven a longer distance to get it home, This has been made to have weekend fun at car shows and local events. It is very rare piece.